If AT&T charged your cell phone bill for ring tones, text messages, love tips, or other purchases you didn’t authorized, you could be eligible for a refund under a $105 million settlement between AT&T and federal and state law enforcement officials. The agreement, involving so-called mobile cramming, underscores why you must carefully check your cell phone bill, or any bill for that matter, and aggressively dispute unauthorized charges. AT&T agreed to settle allegations that it continued to allow third-party content providers to bill customers’ phones for hundreds of millions of dollars in unauthorized subscriptions, even though it had received more than a million complaints that the charges were unauthorized, the Federal Trade Commission said. AT&T kept at least 35 percent of the revenue from the charges, which typically amounted to $9.99 a month, according to the FTC complaint. For some third-party providers, complaints to AT&T over unauthorized charges reached as high as 40 percent of the subscriptions that had been billed to customers in a given month. The FTC said that in October 2011, AT&T altered its policy that had allowed its customer representatives to refund up to three months worth of charges for customers who complained, reducing the refund period to just two months. In some cases, the FTC said, customers received no refund and were instead referred to the third-party companies. AT&T has agreed to pay $80 million to the FTC to be used for consumer refunds, $20 million in penalties and fees to 50 states and the District of Columbia, and a $5 million penalty to the Federal Communications Commission. “Although these unauthorized charges were made by other companies, AT&T takes seriously claims that charges on our customers’ bills were not accurate,” the statement said. 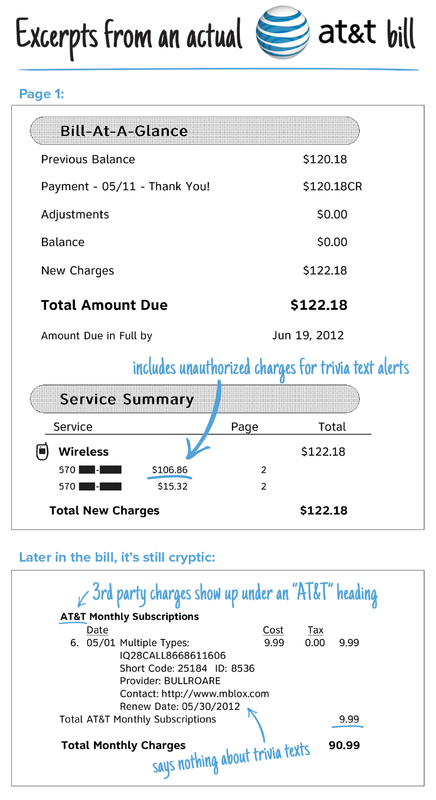 In December 2013, AT&T discontinued third-party billing for so-called premium short messaging services, also known as carrier billing. Donations to charities and political campaigns still can be billed to customer phones. Read "Beware of Bogus Phone-bill Fees" for more tips on protecting yourself from cramming. This is the seventh cramming case the FTC has brought since 2013. In a complaint filed in July, the FTC accused T-Mobile of continuing to bill customers for third-party services offered by scammers, even though it knew the charges were fraudulent. The case is pending. In the same month, the FTC issued a report on mobile cramming that recommended five measures for the industry to take to protect consumers, including allowing customers to block third-party charges entirely. In the report, the industry noted that premium SMS billing, which relies on text messages supposedly sent from the users’ cell phones, is being replaced by so-called direct carrier billing, in which charges are placed on a customer's mobile bill through a mobile website or app. The FTC said the industry should provide ways to protect consumers from unauthorized charges no matter which method is used. AT&T customers who believe they were billed for unauthorized charges after Jan. 1, 2009, can apply for a refund on a special FTC claims website. The deadline is May 5, 2015. Those who are unsure whether they are eligible for a refund can visit the claims website or contact the settlement administrator at 877-819-9692 for more information. Whether it’s a statement for your cell phone, credit card, bank account, or anything else, don’t just let it sit on your desk, in your computer, or online. Check it carefully and complain immediately if you see any charge or deduction you didn’t authorize. The law may limit the amount of time you have to report the problem. Don’t let a customer service representative brush you off. Ask to speak to a supervisor. Always follow up in writing, and keep copies of your communications. If that doesn’t work, complain to the state and/or federal regulator that has jurisdiction over the account issuer.